F(l)avorite Things are posts where we talk about, well, our favorite, flavorful things. Here, Kate pens a love letter to a very pretty, very tasty cake. Yellow Cake with Pink Frosting. Quite simply, you are beautiful. In every single way that a cake can be beautiful, you are. I melt at the mere sight of you. My heart flutters, my salivary glands hop to attention, and the corners of my mouth can’t help but turn up whenever I see you sitting tall and proud on your cake stand throne. Oh my sweet pink and golden beauty, the dull gray drizzle outside cannot darken your moist cheery perfection. My past relationships with the cake base of prettily frosted cakes have been dry, tasteless, and thin. 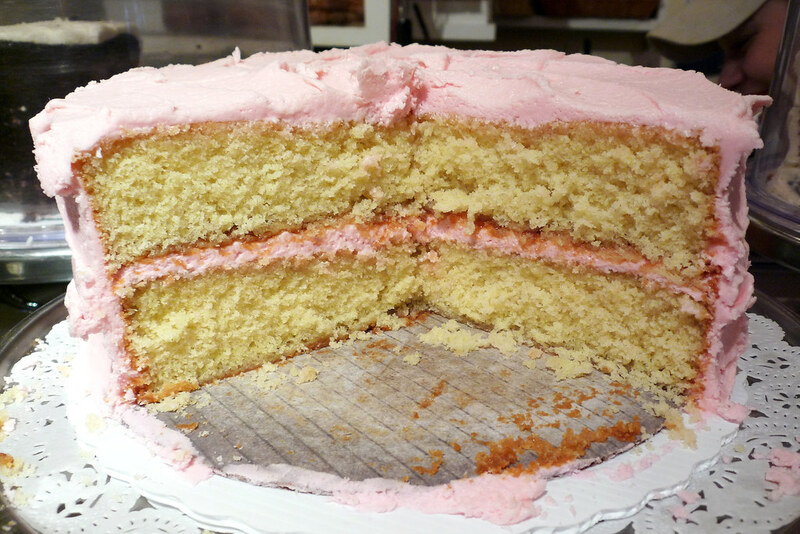 But Amy’s Pink Cake yellow cake base, you are moist, flavorful, full of texture and real ingredients. This is certainly love. You know how I know that? Because before I take the first bite of you, I bring you close and inhale your vanilla cakey goodness. I close my eyes and breathe in again the natural eggs and butter and flour and butter smell and for a moment am lost in sweet reverie. I love the way you smell. It’s chemical. 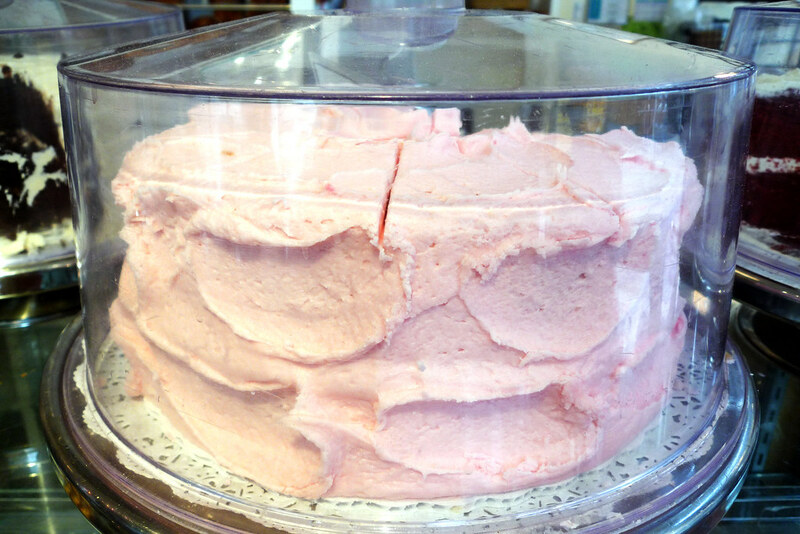 But Amy’s Pink Cake what I absolutely adore about you is the pink pastel perfection of your sweet creamy frosting. It is the stuff that dreams are made of. Your frosting is not mere decoration, adornment, or afterthought, it is who you are. Amy’s Pink Cake, I shudder at the memory of other, poorly constructed cakes (like that cake from Whole Foods who thinks it’s all that but couldn’t possibly be any less), shocking and disappointing me with the discovery the fake fruit filling, forcing me to scrape it off, leaving me with several bites of cake left and no more frosting to accompany it. Every time you and I get together, you ensure there’s enough of your pure delicious frosting to satisfy me till the very end. The cake, sitting inside the case. And Amy’s Pink Cake, you may be self conscious about your size, but I love it. There is just more of you to love my BBC (big beautiful cake)! And you never judge me when I take you home alone, put half of you away for tomorrow, and then end up eating you all the same day (and writhing in a bit of sugar-induced agony as a result– it was worth it). Amy’s Pink Cake, you’ve become so special to me, and it’s time we share our relationship with the world. I’m a woman in love. I want to scream it from the mountaintops. I love this cake! And I want everyone else to love you too. Meet Amy’s Pink Cake everyone. My favorite slice of cake in the city. Everyone, this is Amy’s Pink Cake. Amy’s Pink Cake, this is . . . everyone. 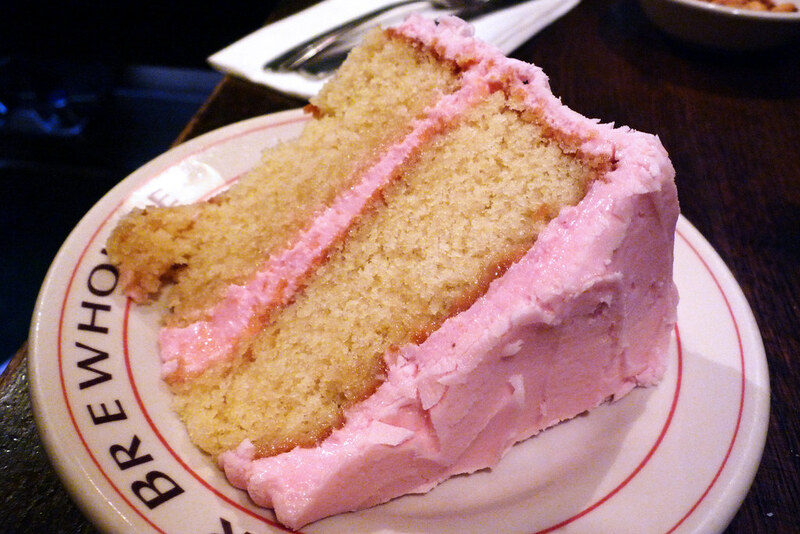 A slice of Yellow Cake with Pink Frosting.